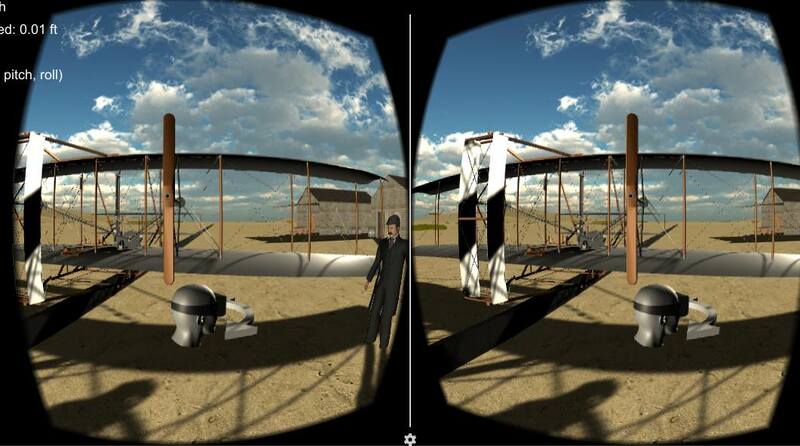 A educational virtual reality project for Google Cardboard that places the user back in time to 1903 when the Wright Brothers flew their first flight. Experience the day the Wright Brothers flew the first flight using virtual reality power of Google Cardboard. 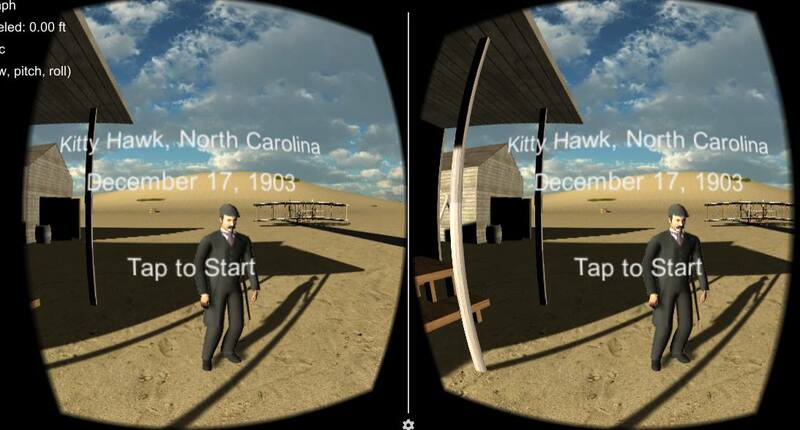 Users will be immersed in Kitty Hawk, North Carolina from the first-person perspective of Wilbur Wright. Orville Wright will explain to you a brief history as well as an educational run-down of all of the components that made the first machine-powered flyer so special. At the end, you will get to test flight the flyer by using the motion of your head. The entire experience should last around three minutes. We were motivated by the novelty that was the first flight. Not too often are non-violent events known through history, so it is a refreshing endeavour to explore this piece of history. We also were motivated by the fact that the actual flying of the Wright Flyer would be a fun experience within a virtual reality environment. Along with that, the Wright brothers themselves are interesting, and we thought it would be fun to bring life to them. From an educational standpoint, all of the group members agreed that it there was a lot to learn about the components of the Wright Flyer. The controls and components of the original Wright Flyer were revolutionary and it is important to understand why and how these specific components led the world into a new age of aviation. It was the first plane to implement three axis of controls The three axis are modified using components on the aircraft The yaw by the back rudder, controlled by the center hip cradle The roll by wing warping, also controlled by the center hip cradle The pitch by the front elevator, controlled by a lever in the front The engine that rotates a bicycle chain that rotates the propellers. The way we will present these learning objectives is through is by teaching these controls kinesthetically. The users will be instructed to perform a roll, pitch, and yaw with there head and will receive feedback for how far their head performs. This is quantifiable as the number of degrees the user heads turns, the number of degrees the appropriate plane part turns (e.g. the back rudder). How airplanes fly (rudders and stuff), how headwind increasing lift. A basic history of the first flight, such as the fact they used bicycle chains on the engine and facts about the “first flights” (how well the plane flew (time, distance, etc.)). How the first airplane was flown. The user will go through a flight simulator controlling the Wright flyer. The flaps on the plane will adjust to the user’s roll, pitch, and yaw, as well as the direction of the plane itself. The user will be alerted of how far they have flown and will be able to take that value as a quantification of their own skill at piloting the the Wright Flyer. It is an attainable knowledge that is relevant to the study of early aviation and targeted for most anyone who would want a knowledge of the material. The environment is supposed to be a close replica of what Kitty Hawk, North Carolina actually looked like during 1903, nothing more than sand dunes and a few sheds. User plays as “Wilbur,” one of the Wright brothers. This is significant because the user is also referred to as Wilbur throughout the scene by Orville. Eventually the user may feel a closer connection to the character after extended time playing as WIlbur. This would lead the user to a more believable feeling of presence higher. The experience leverages audio sounds, such as ambient noises, voice acting, propeller sounds, and more. A narrative give the user a hint of what historical period they just jumped into. Care was taken in placing realistic animations on all different components of the experience. 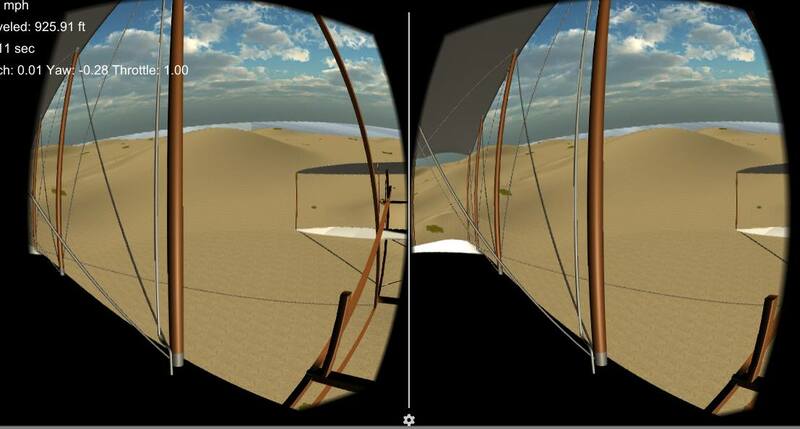 Walking around as Wilbur as well as the control of the Wright Flyer give the player a strong feeling of control within their environment as everything is controlled by the user’s viewpoint and orientation. QUESTION: Ask participant to give an example of the knowledge they already have around the learning objective. Orville Model and texture remodeling (from Western Lawman). Kitty Hawk tables, wood planks, ect. 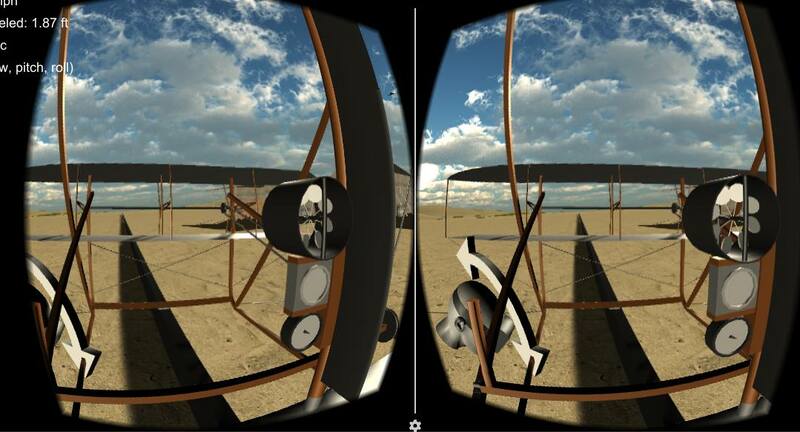 VR-Wright-Flyer is maintained by jpecoraro342. This page was generated by GitHub Pages using the Cayman theme by Jason Long.